So when I found out that Grand Valley offered a costume class in the theatre department, I knew I had to take it. I did. It was amazingly fun and I gained a lot of confidence in my sewing. It snagged me and now I'm a theatre minor. However, that's beside the point. Nevermind that it's taking over my life--the dress is what's important here! 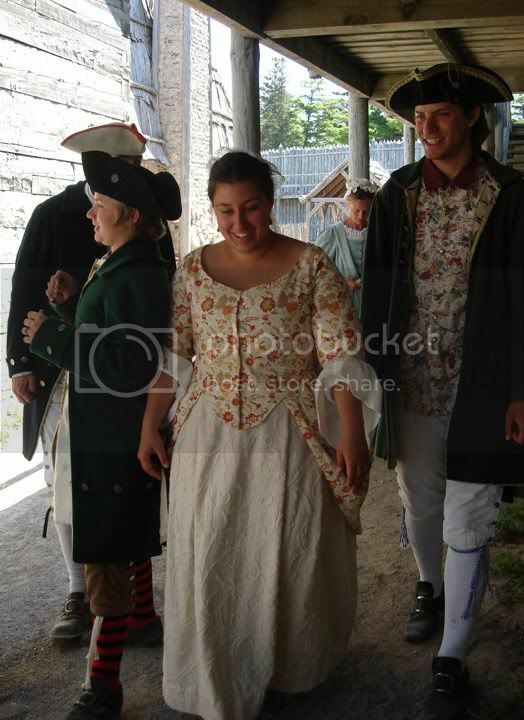 This frock was my final project for CTH262, Costume Construction. In that class, we learned how to draft a basic body block, a sleeve sloper, drape a pattern, and all sorts of other cool, useful stuff. Doing all that, though, gave me the confidence to drape my own pattern for my bodice. I used my basic "historic" bodice pattern, which started life as that Butterick regency pattern, added a lot of fabric to the bottom so it was waist length, and asked my mom help me pinch it in at the seams until it looked right. I had to re-position the princess seam in the back so it extended up to the shoulder seam rather than under the arm. Also, I had to change the sleeve around and refit it, so now the whole thing bears little or no resemblance to the original pattern. But it looks period! The dress itself is made of a printed cotton twill from--guess where--Hobby Lobby's home dec section. I flatlined the bodice to unbleached muslin and lined it with the same; I probably could have done without the flatlining, but at least now I know it's really sturdy and will stand up to a lot of abuse. It's bag lined, so the edges are all finished and pretty on the inside. Of course, the bag lining made me want to claw my eyes out, but it looks nice now, and again, it's sturdy that way--no raw edges to catch and fray. The first petticoat wasn't actually part of the final project--I started it a way long time ago and finally got around to hemming it when I decided I wanted to wear this outfit to Holly's Christmas concert. It's a heavy cream-colored linen, approximately 54" wide--with allover tone-on-tone crewel embroidery. This was also from Hobby Lobby, several years ago. I think it was like $2/yard or something obscenely cheap like that. It's insanely simple, just two widths seamed together at the selvedges and pleated to tapes at the waist. It ties around the waist, and that's it! I didn't know much about this costume thing when I made it, so the tapes are double wide Wright's bias tape. If I were to do it again, I'd use twill tape, but the bias is holding up all right so far so I'm not going to bother to change it. Since variety is the spice of life, there's also another petticoat to go with this polonaise. The second, newer petticoat is red linen with a flounce around the bottom. This silly thing gave me way more trouble than I anticipated, but once it was finished I was quite satisfied. 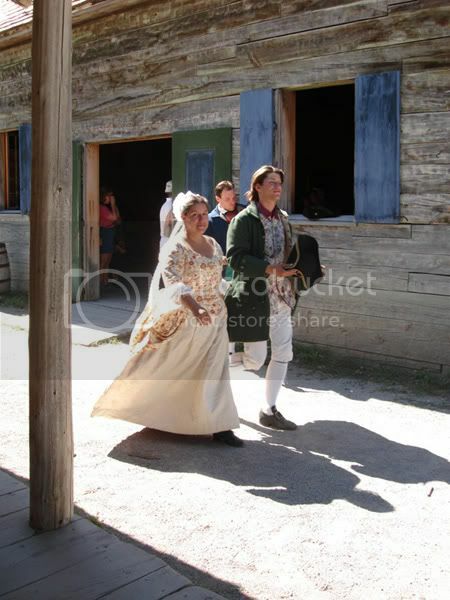 This petticoat actually became one of my favorites and saw a lot of wear this summer (2006). It doubles under my work-a-day costume quite nicely sometimes! Fort Michilimackinac is the most beautiful place I've ever been, I'm convinced. 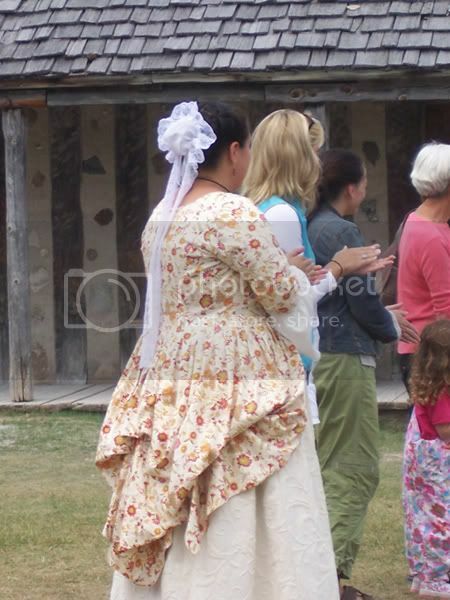 This little polonaise, with the addition of some embroidered sleeve flounces and a lacy cap, served many a gorgeous summer day in the wedding reenactment held in Ste. Anne de Michilimackinac. Here I am as "Therese," with "Josef Louis Ainsse," who happens to be wearing the awesomest coat ever made. After the wedding, there was always a dance that gave the visitors a chance to celebrate with the "newly married couple." 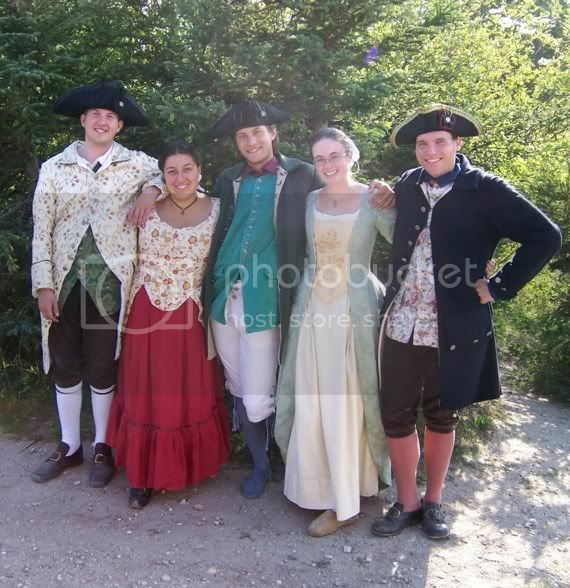 My last evening at the fort, my photographer roommate had us all come in for a photo shoot. we all dressed up fancy and she took pictures of us doing fun things. This isn't one of her photos--it's actually just us goofing off at the end of the day. 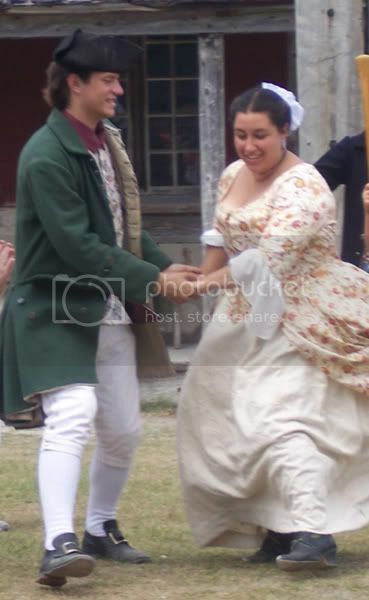 However, we were having a good time, and there's finally a shot of that red petticoat I was talking about. ...And then, a knife fight can-can line broke out. I neither confirm nor deny anything!